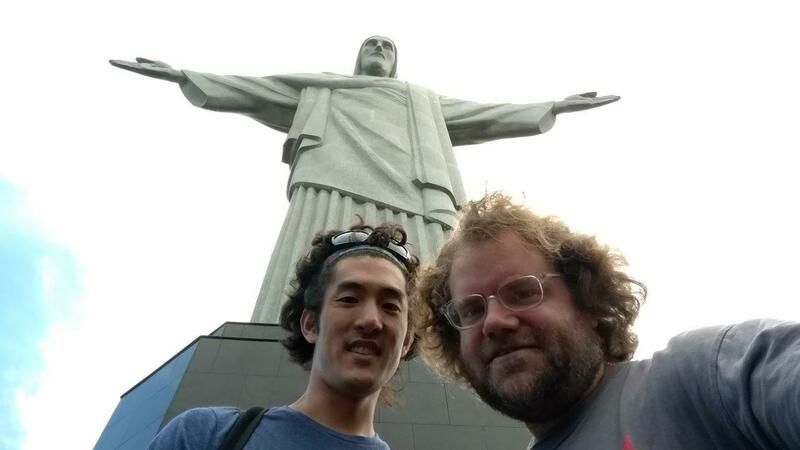 On Thursday, March 2, we finally headed out from Rio de Janeiro, exhausted from the Carnaval season. Thanks to 7,500 British Airways Avios and a small copay per person, we had access to a nice free flight to the western border with Paraguay and Argentina, at the amazing Iguaçu Falls. These falls need to do a lot more marketing, as a lot of people have never heard of them, but they’re taller than Niagara Falls, and twice as wide! 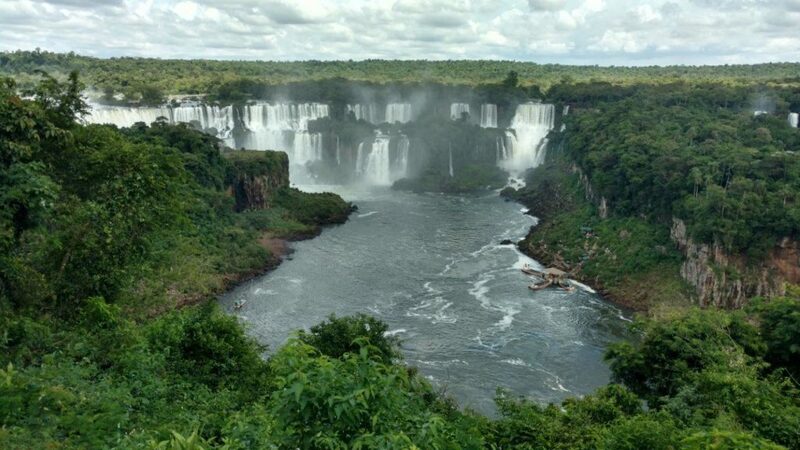 While the Brazilian city of Foz do Iguaçu touches both the Paraguayan and Argentine borders, the waterfalls themselves are a little to the east, straddling the Brazil/Argentina border and not touching Paraguay. Travelers will usually pick an accommodation on one of the two sides, then spend a couple days, seeing the falls from each side on one day. We stayed at a really cute hostel on the Brazilian side, then spent our first full day March 3 taking a bus to the Brazilian side of the falls. 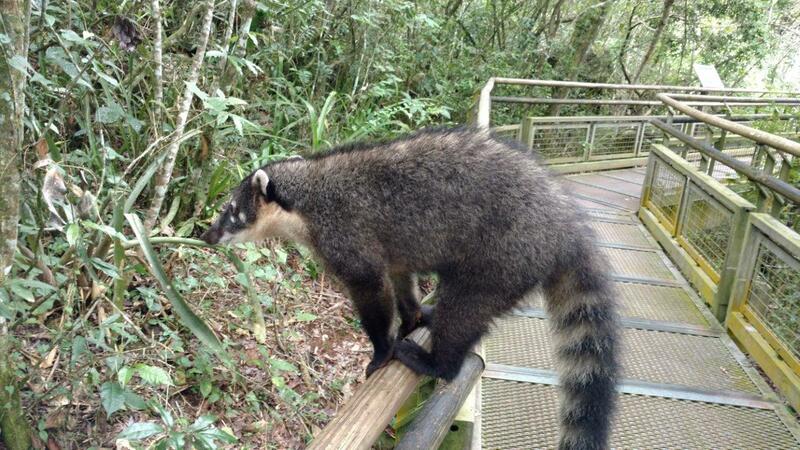 Interestingly, this was our first experience with a local animal, the Quati, that looked a little like a raccoon but with a long snout. 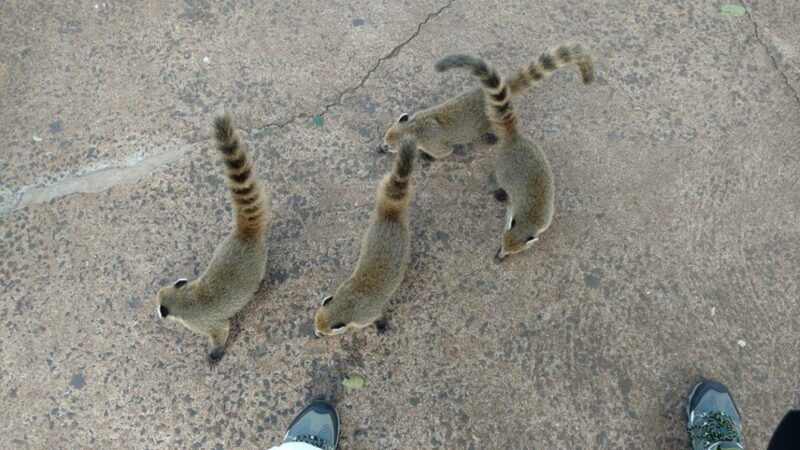 They were adorable from a distance, but plenty of signs warned travelers not to feed them, lest they start to get aggressive and bite. 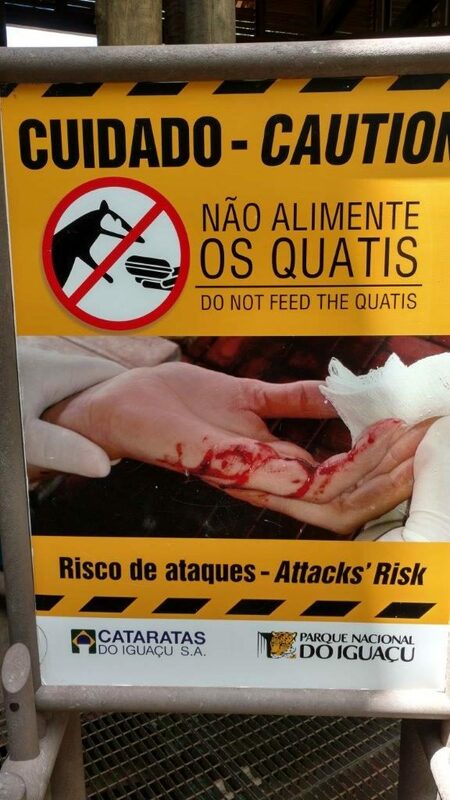 This sign was enough to make all the children cry whenever they saw the animals. The quatis might bite according to the signs, but they’re still cute! Hi buddy! The falls themselves are beautiful. It’s hard for pictures to do the scenery justice; the waterfalls are so broad and so numerous that even panoramic pictures can’t really convey how large they are. View of the falls from the Brazilian side. Completely stunning. 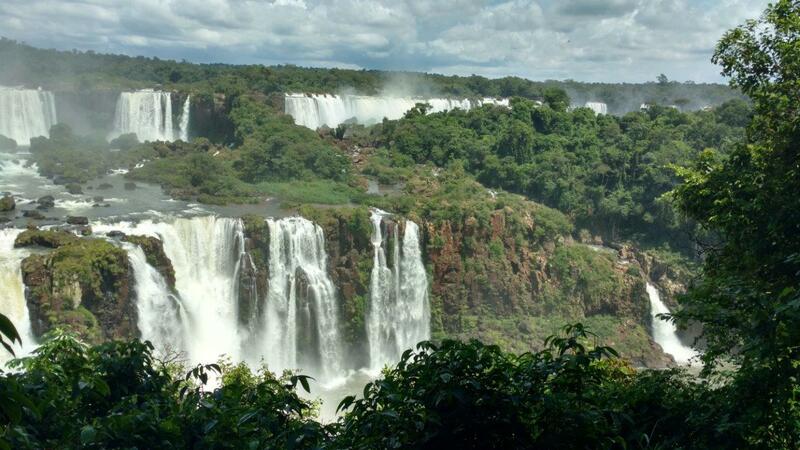 On March 4, while still sticking with our lodging on the Brazilian side, we took a daytrip over to the Argentine side to see the falls from a different perspective. We had a really great day; it was one of the first times on our trip we met other travelers and had personal chemistry strong enough that we spent the day together! After having boarded a bus to the Brazil-Argentina border, we found out the process of passing through immigration for a day trip was a little slower than we wanted. While waiting at customs for a second bus to come along, we struck up a conversation with a pair of women (who were traveling solo and also meeting for the first time). Alicia, from the UK, and Katharina, from Germany, were also both staying on the Brazilian side, and the four of us had a great day swapping stories and helping each other get some great pictures at the falls. The Argentina side definitely has a lot more to see than the Brazilian side of the falls, and you find yourself much closer to the falls. That tends to make it more impressive in person, but a lot harder to convey that grandeur through pictures. On our way back to the Brazilian side for the night, the four of us shared a taxi and found that it was about the same price as public transportation but an hour faster! For me and Charley personally, this was the first time we’ve crossed a border in a taxi, and it was a lot more seamless than we expected. The driver came equipped with a paper form for the four of us to list our names, nationalities, and passport numbers, and he pulled up to passport control and handed over his completed form and our four passports. Unfortunately, we didn’t take any pictures of the Brazilian barbecue we had afterwards, but rest assured we took full advantage of all-you-can-eat meat for $10 USD. 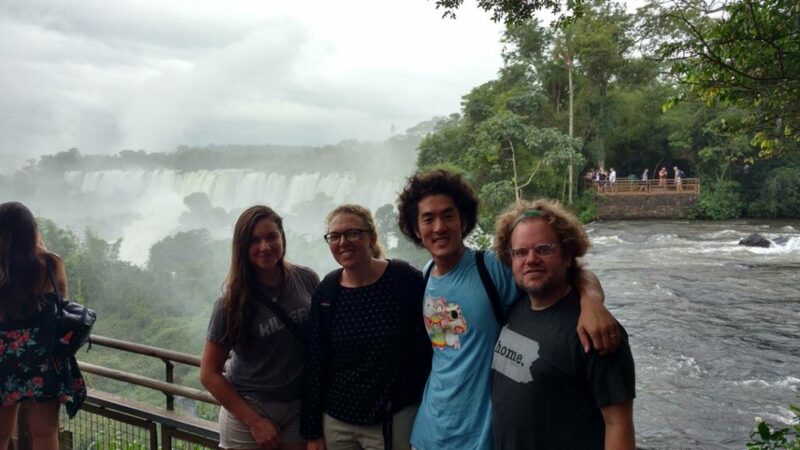 Iguaçu Falls was a really incredible experience; we made sure to exchange contact information with Alicia and Katharina, hopeful that our paths will cross again in the future!